Camperdown Health & Hygiene has a proven track record in the supply and servicing of portable chemical toilets to wide variety of clients. 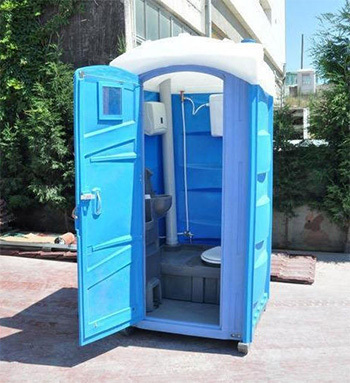 We provide both surface toilets at special events, music festivals, exhibitions, fairs, building sites as well as underground.In fact, anywhere toilets are required instead of permanent toilets being built, we can provide. The toilets used by us are manufactured from material which limits the ease of ignition, flame spread and smoke generation thereby making it ideal for use underground. Research has shown that the introduction and sensible distribution of portable toilets underground enhances the productivity of underground staff as it reduces the unnecessary movement of staff wishing to utilize toilets. We can supply a standard portable toilet with a bucket system or a upmarket flushable toilet that can be equipped with a water basin, mirror and toilet roll holder. The latter comes with a 45 liter water tank. If required, toilets can be provided with sanitary bins. All toilets can be rented at very reasonable rates.